"These healthier gluten-free, vegan, no-sugar-added muffins are great for breakfast or an afternoon snack. No guilt eating one of these." Preheat oven to 350 degrees F (175 degrees C). Line a 12-cup muffin tin with parchment paper liners; spray liners with cooking spray. Place dates in a bowl; cover with soy milk. Let stand until softened, 10 to 15 minutes. Mix water and flax seeds together in a separate bowl. Let stand until thickened, 5 to 10 minutes. Combine oat flour, millet flour, tapioca flour, baking powder, cinnamon, and baking soda in a bowl. Mix well. Place the soy milk-date mixture, applesauce, and vanilla extract in a blender or food processor. Blend until smooth. Transfer to the bowl with the flour mixture; add the soaked flax seeds. Mix with a spoon until no dry spots remain. 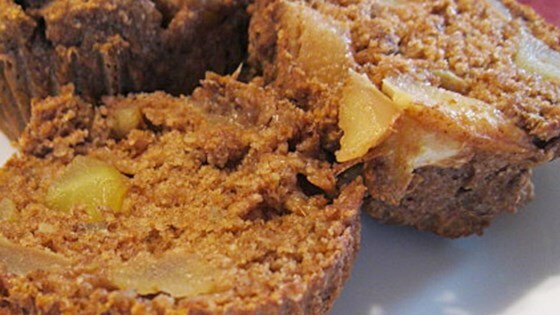 Fold in apples, walnuts, and raisins gently. Spoon batter into the muffin cups. Bake in the preheated oven until a toothpick inserted into the center comes out clean and tops begin to brown and form cracks, 30 to 35 minutes. Cool for 15 to 20 minutes before serving.